Haidakhan Wale Baba lived in the foothills of the Himalayas, in the Kumaon region, birth place of many of India's great saints. He was acknowledged as Shiva Mahavatar Babaji, the eternal manifestation of God in human form. Babaji's recent physical manifestation was between 1970 to 1984, when He appeared in a holy cave at the foot of the Kumaon Mount Kailash in a remote village called Haidakhan. Many people, from all over the world, have mystically been drawn to Babaji through extraordinary events, dreams and visions and are receiving His Blessings. Babaji urged the people to "follow the religion that is in your heart." He said "every religion leads to the same divine goal" and that he had come to revive the eternal and ageless religion, the Sanatan Dharma; the three basic principles: Truth, Simplicity, and Love. He emphasized constant repetition of the ancient Sanskrit Maha Mantra, OM NAMAHA SHIVAYA - "Lord Thy Will Be Done." Shri Babaji is acknowledged as the Shiva Mahavatar Babaji described by Paramahansa Yogananda in Autobiography of a Yogi by Paramhansa Yogananda. A Mahavatar being a human manifestation of the Divine who can materialize a body at will. Babaji's devotees believe that He has continually manifested since Creation to help Humanity. One manifestation of Babaji was around 1800 at which time He traveled extensively in the Kumaon region of the Himalayas, gathering his devotees and disciples around Him. In 1922 He traveled to the meeting place of the Kali and Gori Rivers, seated Himself on the surface of the water and disappeared in a ball of light. 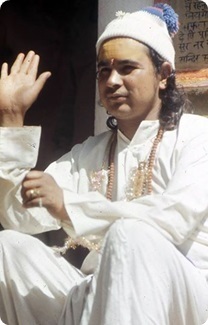 His latest manifestation was between 1970 and 1984, and was foretold by a great Saint, Mahendra Baba, who following a lifelong search for Babaji, experienced a miraculous meeting with Him at Siddhashram, near Ranikhet in Uttar Pradesh, India. Thereafter, Mahendra Baba devoted himself to traveling through India prophesying Babaji's return. Babaji appeared in 1970, as a youth of 18 or 20 years, in a holy cave at the foot of Kumaon Mount Kailash at Haidakhan, near Haldwani in Uttar Pradesh, India. His divine power was experienced in many ways: in September of 1970 He ascended Mount Kailash and sat on the summit without food or sleep for 45 days; several people saw Him simultaneously in different places; He healed the sick; He brought transformation into many people's lives. Babaji spent most of His 14 year incarnation at Haidakhan where he established a beautiful ashram, and near the village of Chilianaula, near Ranikhet, He built a large and breathtakingly beautiful temple and ashram overlooking the Himalayas. Babaji taught that He had come to revive the Santana Dharma, the ageless Eternal Religion from which all religions have come. He stressed three basic principles: Truth, Simplicity and Love. He emphasized constant repetition of the mantra Om Namaha Shivaya, "I surrender to God", and selfless service to Mankind. Many people have been drawn to Babaji and many spiritual centers in the West have been dedicated to Babaji and His teachings. Thousands of people all over the world have received Babaji's blessings and have been called to the spiritual path through extraordinary events, dreams and visions. Babaji left his body on 14 February 1984. He had come to give a message to the world, and having done this, He left. His last message was: "I am always with you." Chanting: Chant the name of the Lord always. By chanting the mantra, its vibrations spread all round you. You will then meditate for yourself and others. By holy chants alone, I will lead and win any war in this world. Whatever happens, all the devotees of God will be saved by Divine Will. Devotion: Devotion (Bhakti) and faith are the basis of everything. Through devotion alone, one can achieve everything. Complete faith, surrender and obedience are required. "You can only know Me through love - Divine Love, love for God, without any selfish purpose." About Himself: I am Bhole Baba (the Simple Father). I am nobody and nothing. I am only like a mirror in which you can see yourself. I am like fire. Don't keep too far away or you will not get the warmth. But don't get too near or you may burn yourself. Learn the right distance. My name is Maha Prabhuji (the Great Lord). Om Namah Shivaya: This is the Mahamantra, the great original mantra, given by the Lord to humanity. Everyone should repeat it. It can be given to everyone and everything can be achieved through it. The power of Om Namaha Shivaya is infinite. This mantra is more powerful than the atomic bomb.